available with or without handslots) are ideal for a variety of cadaver storage applications. 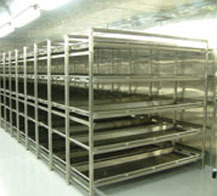 The Mortuary Storage Rack System is more compact than conventional cantilever storage units allowing for greater storage capacity without increasing space. Can also be used in the Total Roll System adding even more versatility. The Mortuary Storage Rack unit is fabricated from 1-1/2” heavy 11 gauge, 304 stainless steel with #4 finish. Heavy-duty 5” swivel casters, all with brake mechanism, allow for effortless movement. Roller assemblies mounted in each bay make loading and unloading the cadaver tray quite easy. CARRIER WEIGHT: 145 lbs. approx.